Borage oil is excellent for skincare especially on dry or mature skin. Borage oil is also known as starflower oil and is derived from the seeds of the borage plant, a large plant with blue, star-shaped flowers found throughout Europe and North Africa and naturalised to North America. Our borage oil contains a high amount (30%) of gamma linoleic acid (GLA) a fatty acid that the body converts to a hormone-like substance called prostaglandin E1 (PGE1) which has anti-inflammatory properties. Borage oil is excellent for skincare especially on dry or mature skin and it has been confirmed that the borage plant encourages the production of adrenaline which helps the body cope with stressful situations or for mental exhaustion and depression. It may also improve mood in menopausal depression. 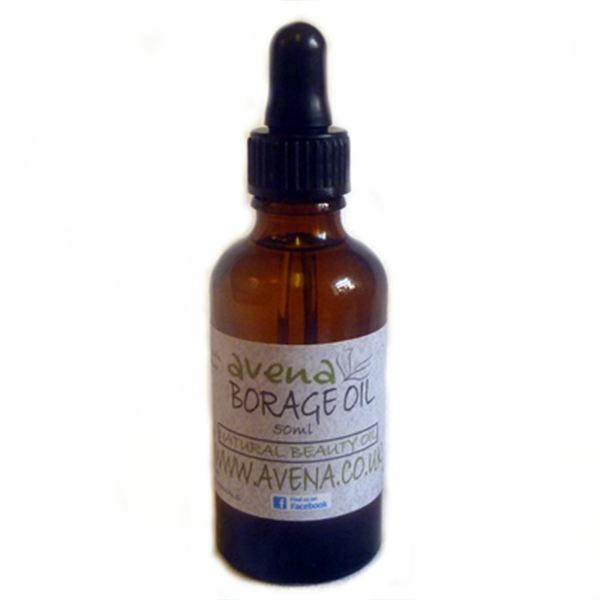 Our borage oil can be added to other carriers at 10% to 15% to give blends a boost. It can also be used undiluted as an intensive night treatment for the face or neck, for restoring skin smoothness and flexibility, it may also help to reduce trans-epidermal water loss by restoring skin smoothness and flexibility. It is said to be particularly good for use on people suffering from eczema and psoriasis. Borage can be used in shampoos as an active ingredient for dandruff sufferers and is widely acknowledged for its use on stretch marks. Avena are wholesale and retail carrier oil suppliers and have a high turnover of oils ensuring great quality and fresh products. We constantly source oils and trade socially aware ingredients from fastidious parts of the world so you can buy with confidence.